Mr. Juriga looks on the icon of Saint Elias. The wind turbine was named after Saint Elias, a prophet because Mr. Juriga believes that wind energy is prophetic in our need for a clean energy world. Mr. Juriga was an outspoken anti-communist in his youth (he learned English from textbooks to escape communism) Mr. Juriga's faith led him to join the Orthodox church and to study theology at a time when anti-communists were prohibited from studying. 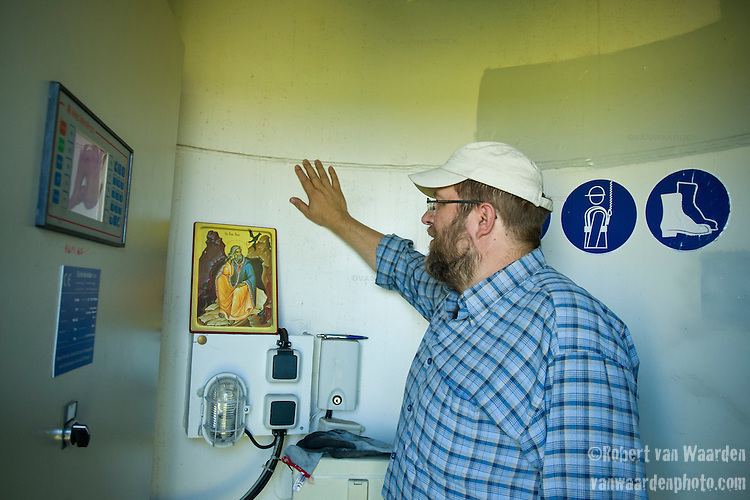 His vision to create a renewable energy future for the church and community of Vilemov was realised through the support of the church. Mr. Juriga is currently the director of the Orthodox Academy, an institute that helps educate school kids about clean energy in Czech Republic. The Academy runs solar, wind and hydro installations and is supported by the revenue generated from the wind energy. He strongly believes that community involvement and small-scale energy production is essential to the development of a post carbon world. Unfortunately, the system in the Czech Republic and Slovakia is heavily tilted in favour of large energy producers. The process is buried in bureaucracy and controlled by industry heavy weights, meaning it is tough for independent producers or communities to raise the funds and/or complete the process.